Orca Gold Receives Ministerial Appr | Orca Gold Inc.
VANCOUVER, BRITISH COLUMBIA--(Marketwired - Nov. 6, 2017) - Orca Gold Inc. (TSX VENTURE:ORG)("Orca" or the "Company") is pleased to announce that Monsieur Jean Claude Brou, Minister of Industry and Mines of the Republic of Côte d'Ivoire (the "Minister"), has approved the transfer of a wholly-owned Kinross Gold Corporation ("Kinross") subsidiary that holds the Morondo and Korokaha North exploration licenses and the Korokaha South application to Orca. In addition, the Minister has advised the Company that formal written approval is in process for the transfer of the remaining Ivorian exploration assets contemplated under the share purchase agreement between wholly-owned subsidiaries of Kinross, Orca and a wholly-owned subsidiary of Orca (the "SPA") (see Company news release on February 1, 2017). Collectively, the exploration properties covered by the SPA form a strategic portfolio for Orca's expansion in West Africa. Having received formal written approval for the transfer of the Morondo and Korokaha North permits, the most advanced and higher priority properties within the aggregate land package, and having been advised by the Minister that the second approval is in progress, the Company and Kinross have mutually waived the requirement in the SPA to obtain all approvals from the Minister will now proceed with the closing of the Transaction. The Kinross portfolio includes three licenses and four applications covering an area of 1,826km2(collectively, the "Exploration Assets"). The Korokaha North licence and Korokaha South application lie adjacent to the east of Randgold's Tongon Mine in the highly prospective Senoufo Greenstone Belt. The Morondo permit lies at the junction of the Senoufo and Boundiali Greenstone belts to the south west. 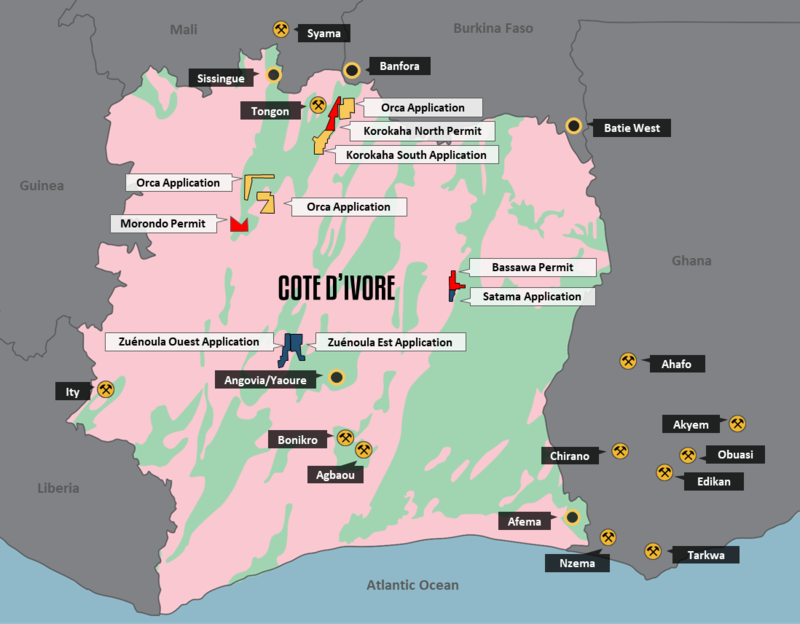 The Bassawa licence and Satama-Sokoura application are located on the southern extension of the Houndé Belt. The Zuénoula Ouest and Zuénoula Est applications are located north west of Perseus's Yaoure project (See Figure 1 in News Release). The Exploration Assets have received little or no exploration. The most advanced property in the portfolio is Morondo, where a discovery was made by Red Back Mining Inc. in 2010. 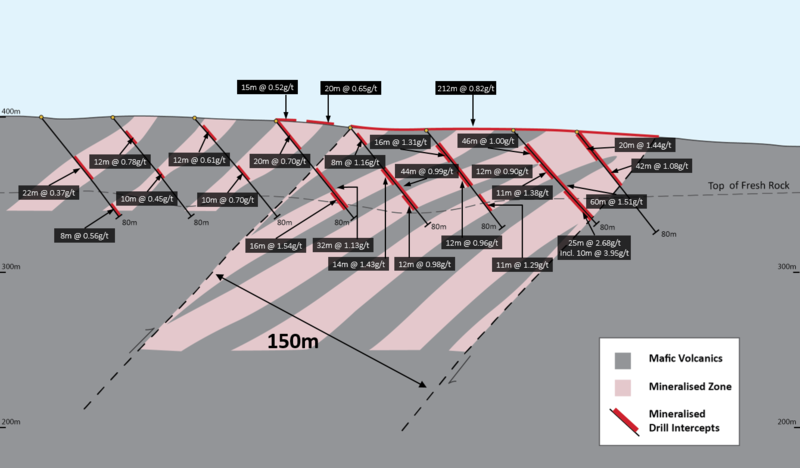 Gold mineralisation has been identified by trenching and 4,284m of shallow (70m) reverse circulation drilling (best intercept 60m at 1.51g/t gold) over an area of 600m x 200m and is open in all directions (See Figure 2 in News Release). Initial metallurgical test work on fresh rock samples from Morondo showed recoveries over 90%. Orca plans to commence exploration as soon as possible, including an initial 2,000m drill programme to test the depth extent of mineralisation before the end of the year. Orca has three additional applications in its own right for licences totaling 1,064km2 in the region of the Morondo and Korokaha licenses. Combined with the acquisition from Kinross, this represents a significant land holding covering 2,890km2 on structural trends that host major gold mines. Reconnaissance exploration will commence shortly and will comprise prospecting, geological mapping and soil sampling, developing a pipeline of targets over the next six months. Commenting on the approval by the government of Côte d'Ivoire to the agreement with Kinross, Rick Clark, CEO and Director of Orca, said, "We very much appreciate the confidence His Excellency, the Minister of Industry and Mines, has shown in our Company and we look forward to aggressively advancing our new property portfolio in this geologically prospective country. The consent by the Minister to our agreement with Kinross expands Orca's operations to another highly prospective geological environment in Africa. The original Red Back team first pegged these properties back in 2009 and we are keen to get back on the ground and explore their potential. We are also pleased to welcome Kinross as a significant shareholder of Orca and look forward to reporting to all our shareholders on the progress of our exploration efforts in Côte d'Ivoire." grant to Kinross a 2% net smelter return royalty on products mined and sold from the Exploration Assets. Orca Gold Inc. (TSX VENTURE:ORG) is a Canadian resource company listed on the TSX Venture Exchange and is focused on exploration opportunities in Africa. In addition to the Côte d'Ivoire portfolio, Orca is focused on its 70%-owned, 2,170 km2 Block 14 Gold Project in the Republic of the Sudan where the Company is currently conducting a Feasibility Study on the project, scheduled for completion in late Q1/early Q2 2018. The technical contents of this release have been approved by Hugh Stuart, BSc, MSc, a Qualified Person pursuant to NI 43-101. Mr. Stuart is President of the Company and a Chartered Geologist and Fellow of the Geological Society of London. This press release contains forward-looking information and forward-looking statements within the meaning of applicable Canadian securities laws, including statements regarding the receipt of the Minister's written approval for the transfer of the second Kinross subsidiary, exploration plans at the properties covered by the SPA, closing of the transaction contemplated by the SPA and the timing of the completion of the Feasibility Study on the Block 14 project ("Block 14") in northern Sudan. These statements relate to analyses and other information that are based on forecasts of future results, estimates of amounts not yet determinable and assumptions of management. The assumptions, risk and uncertainties outlined below are non-exhaustive. Should one or more of these risks and uncertainties materialize, or should underlying assumptions prove incorrect, actual results, performance or achievements of the Corporation, or industry results, may vary materially from those described in this press release. Forward-looking statements and forward-looking information are not guarantees of future performance and are based upon a number of estimates and assumptions of management at the date the statements are made including without limitation, assumptions about the following (the "Forward-Looking Factors"): receipt of all necessary regulatory approvals, future prices of gold and other metals; successful exploration, development, and production of Block 14; the timing and completion of the DFS; the timing and likelihood of a production decision; performance of contractual obligations by counterparties; operating conditions; political stability; obtaining financing on time; financial projections and budgets; obtaining licenses and permits; government regulation of the Corporation's mining activities; environmental risks and expenses; market conditions; the securities market; price volatility of the Corporation's securities; currency exchange rates; foreign mining tax regimes; insurance and uninsured risks; financial projections and results; competition; availability of sufficient capital, infrastructure, equipment and labour; dependence on key personnel; dependence on outside parties; conflicts of interest; litigation; land title issues; local community issues; estimation of mineral resources; realization of mineral resources; timing and amount of estimated future production; the life of Block 14; reclamation obligations; changes in project parameters as plans continue to be evaluated; and anticipated costs and expenditures and our ability to achieve the Corporation's goals. While we consider these assumptions to be reasonable, the assumptions are inherently subject to significant business, social, economic, political, regulatory, competitive and other risks and uncertainties, and contingencies, many of which are based on factors and events that are not within the control of the Corporation and there is no assurance they will prove to be correct.